Recently had a request for this one, and an interesting pick at that. 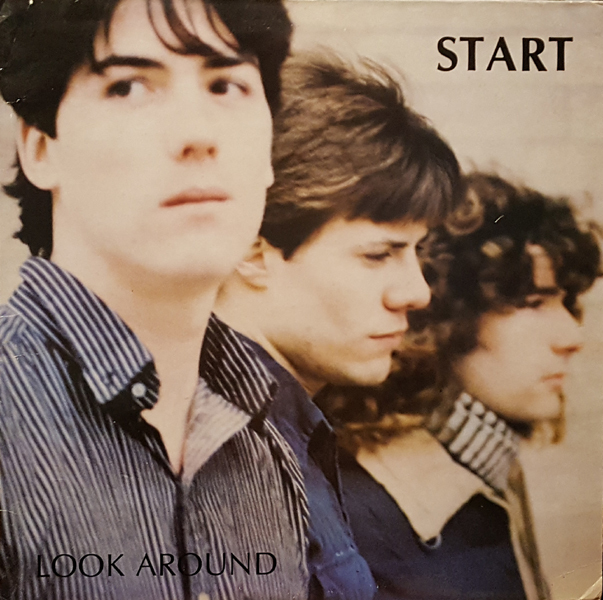 Taking Look Around's album sleeve at face value you might reckon Lawrence, KS' Start were on the same wavelength as the Smiths or Rain Parade. Not completely off the mark, but this trio's inclinations were more disparate than that. The first side emanates some choice, left-of-the-dial leaning pop, like the Wurlitzer-spiked "Empty Rooms" and the even more coveted "Where I Want to Be," oozing with chiming guitar strains and DIY ethos that might as well have predicted what Brit indie titans-to-be Primal Scream would have in store just a couple years later. Very much on the Postcard Records tip I might add. Side two gets a lot more unpredictable, commencing with "Little Fish/Big Fish," featuring none other than Allen Ginsberg reciting a poem regarding U.S. involvement in Central America atop these guys providing the music bed. A bit disorienting at first, but somewhat fascinating on return visits. Word has it Start had connections to William Burroughs as well. 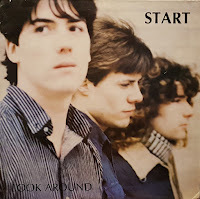 "My Town" prominently features trumpet, and is almost another harbinger of mid-80s UK indie pop. Problem is the band didn't bother to insert a hook anywhere. As for the remainder of Look Around, there's not much else that's overwhelmingly effective, but not unsatisfactory either.